Selfies and video chat lighting often leave us washed out, overexposed, or dark & dreary. Thankfully, pro photographer Henry Geddes came up with an easy fix. Slide Chatlight onto your laptop, tablet, or phone, and you’ll be seen in a flattering light. Whether you’re Skyping with coworkers, FaceTiming with family, or snapping a selfie, your close-ups will be polished and professional. 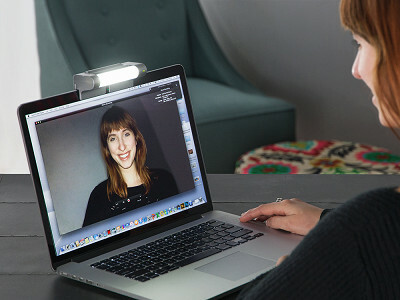 Chatlight shines a soft light on your face, which helps the camera know that you’re the main focus. Even though you can tell the difference between a blank wall and a face, most webcams, phones, and tablets can’t. They expose for the “average” amount of light in the frame, leaving you with weird tints, harsh shadows, or backlighting. With the advances in LED lighting over the last few years, Henry and his team were able to put high-quality, flattering illumination in a portable, affordable package. You’ll easily be able to put your best face forward. Hi! Henry here, excited to be launching the Chatlight on The Grommet today. I'll be happy to answer your questions. Can this be used in place of a flash to take photos? @Kellie Yes, it can! Photos can be taken with a flash or a continuous source of light, such as the Chatlight. For Kellie and everyone else, below are a few videos to help you get even more acquainted with Chatlight. Can it be used on an IPad? @Jackie yes, Jackie. It fits onto phones, ipads, laptops and desktops. @Caroline Thanks for the kind and encouraging words! The lighting tube moves/swivels up and down directing the light either to your face or down on the keyboard area. The light illuminates a good 2-3 feet away. I would say a distance of 20 inches to be optimal on the high setting. @Richard Hi Richard! Thanks for the inquiry, the Chatlight expands to 3/4 inch. I have a heavy duty Otter box cover, and this fits it snuggly. We also provide a pre-cut set of velcro in the box to provide another way of attachment for those with thicker monitors. @Henry Yes, very helpful. Thanks, Henry. It looks like it is designed to attach to a laptop or tablet. It doesn't look like it will attach to an average monitor that is about 3/4" thick. Any suggestions how I might overcome this? Thanks. Cool idea, Henry! 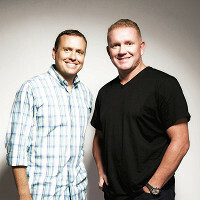 Having been a creative person in advertising my entire career, I truly understand the power of GOOD LIGHTING. I'm a bit concerned your device won't snap easily onto my Apple monitor. BUT.. if I velcro it on my desktop, can the light still be removed and easily snapped onto my iPad or my iPhone? Also, I don't see comments on battery life here. I wouldn't want my lighting to blink out in the middle of a web conference....thanks! @Rachel I'll let Henry's video cover the question about the velcro. Our Grommet video covers the battery life question. You will get 90 minutes on the battery or unlimited time if you just keep the Chatlight plugged in while using it. @Rachel Thank you, Rachel! Great questions and here are some answers that I hope will help. If you use the velcro, the Chatlight can be easily removed to use on your other devices. In fact, we have several Chatlights that we do this with ourselves as we have different monitors with different widths. There will be a video up of tips and tricks shortly that might be helpful for you to watch to get a better idea of how that can work. As for battery life, Chatlight runs on a rechargeable lithium battery that lasts about 2 hours on a full charge. For longer conferencing, simply plug the Chatlight into a USB, such as your laptop or into a wall socket and it will run for days. The green light will start to flash red as a warning that your charge is almost out. It's great to hear from a creative like yourself who understands how lighting can make or break an image. We do suggest 2 lights for professional use and Grommet it offering a special 2 light discount with free shipping. The 2 lights are placed on either side of a monitor for a really professional, even lighting solution. @Henry Thanks for your replies....Just ordered two Chatlights. My mug on web conferences can use all the good lighting it can get, haha! Peace, guys. Hope your launch goes astral! Sending you energy from the Rocky Mountains. I would like to purchase 2 of these (Buy 2 or More $27.50 each) but the shopping cart still shows the original cost $29.95! Hi there, follow it through until the end of the checkout process and you will see the discount applied there. If the problem persists, let us know and we will look into it. Is there Mercury in any of these lights? I know at the end of the year they are taking out the curly led light bulbs at Home Depot because a clerk told me there is mercury in led lights? I'm quite interested in purchasing your lights if they are Mercury free. I have a ipad2 air. @Beverly Wow, Beverly! I had no idea about that. But, rest assured, the LED lights in the Chatlight are not the curly bulbs but instead a strip of diods that are mercury free. Diods are an electrical technology, not a chemical one. I hope that helps! @Henry Just FYI, it's fluorescent lights which contain mercury. And, as you say, LEDs (Light Emitting Diodes) are fine. Hi Henry, I love the idea because you have solved a problem I am having! I am wondering how it feels to my eyes and face to have this light shining right at me. Am I going to feel like I need to squint while I'm talking to clients for an hour at a time? @Joni Hi Joni, this is a very common concern and I know exactly how this could be an issue. Like all studio lighting, the person in front of the camera should not be looking directly into the light itself. Instead, focus your eyes into the actual camera lens to get the best and most personal engagement. I would suggest using the light slightly mounted off-center. Better still, use one light on the side of the monitor and the other off-center on the top. This way the light surrounds you in a balanced way, and you are less inclined to be drawn into looking at the light source. Having said that, the light is bright but has 2 settings should the high setting be too bright. I hope this helps Joni! Thanks for the great question. Hi! What types of phones and sizes of laptops does the Chatlight work with? Also, I am concerned with the light causing my devises to overheat. Is this an issue? @Sarah Hi Sarah! The beauty of LED's is that they do not emit much heat. You can actually touch the light as they do not emit much heat at all. The Chatlight works with all sizes. It has an adjustable attachment. Please see our tips and tricks video up top for what to do if your laptop, phone or desktop is too thick or thin. We do include velcro for thicker devices. Thanks for your question, Sarah. @Henry Thank you, Henry. This sounds like a great product. I look forward to receiving it! @Sarah You are most welcome. Your support means a lot to us! Inhteresting!, How many Lumen does this light put out? Could I use this to mount on top of a make-up mirror? It has an incandescent 40 Watt bulb which does not provide enough lightning . I just had the same thought! @Jacqueline Hi Jacqueline. Yes, we know people who are currently using the Chatlight on their makeup mirrors. It is quite versatile. Light measurements are typically done in Kelvins and Lumens which can be confusing. A basic 40 Watt bulb emits about 400-600 lumens, But, the light is emitted equally in all directions. Therefore, you are only getting a small percentage of the light cast on you. The crucial measurement is "delivered light". The Chatlight is designed in such a way so as to very effectively illuminate a subject which is roughly 2 feet by 2 feet in front of a monitor, phone, etc. Within that physical space, the Chatlight is emitting about 420 lumens. More importantly, it is bright and will do a very nice job for your makeup mirror. One huge benefit of the Chatlight is that it produces no infrared energy, thus generating no heat. No makeup melting! I hope that is not too technical but answers your question adequately. We hope you try it out. Thank you, I will buy two of them. One for the make-up mirror and the other one to attach to my book case over the drawers with all the CD's! @Jacqueline Super!! Thank you for the support, Jacqueline. All the best. This is a great idea! Although I don't need one for any of my devices, I was thinking how great this would be attached to a free standing make up mirror. The room I have my make up table in does not have good lighting. The mirror I have is about the size of an i-Pad, and the light looks like it would fit on it quite nicely. The two light settings is a bonus. @Barbara Hi Barbara. I hope that you are able to see my answer to Jacqueline above. She too is looking for a makeup lighting solution. I have a professional photography studio in Miami where w know how important makeup mirrors and lights can be. Two years ago, we replaced our makeup rooms with all LED bulbs as the models and makeup artists found the heat from the many makeup bulbs to be extremely hot (andwe are in Miami, to boot!). The Chatlight is a very nice, portable, adjustable solution that should do the trick for you. Please let us know how it works out for you, if you choose to give it a go. PS- my wife has one attached to her magnifying mirror at home. @Henry Hi Henry, thanks so much for your speedy replies. I did see your reply to Jacqueline. All of the questions and answers have been very helpful! @Barbara You are most welcome. Glad to be of help! Great idea, Henry. Can you tell me what color temperature the Chatlight is? @Eric Sure thing, Eric. As you may know, lights are measured in 2 ways, Kelvins and Lumens. Kelvins refers to the warmth/coolness of the light. Chatlight is at about 3800 lumens. @Henry Hi, Henry - did you perhaps mean 3800 degrees Kelvin? @Brian You got me there, Brian! Yes, 3800 Kelvin. Thanks for catching that!! @Henry Good to know. Now that you mention it, do you have a spec for the number of lumens? I love this! I also thought about makeup use, using to take better-lit portraits w my cell, etc. One question: my phone (LGG4) has a selfie ("front facing") camera that is about 3/4 inch off center, to the left when looking at the screen. How would this light attach appropriately with this configuration? The back facing (taking normal pictures of other things) is centered. Thanks. @Dayle Hi Dayle. Good question. You can angle the Chatlight at 45 degrees, attaching it to the corner of your cel phone. Another way is to hold your phone horizontally and attach it there. There is a cut out for the camera lens for phones, ipads, etc. Our Getting Started video, up top of this page, should help you out. I hope that helps you out! Would this work with an old film camera as a flash for it? @Bill Hi Bill! Yes, it would work so far as it could be a continuous source of light. I am not sure how it would connect to your camera, but we could put our minds to thinking about how to do that. I guess it would greatly depend on your camera and how to attach the Chatlight to it. But if you have a solution for that, you are good to go. This is a great product. I have been trying to figure out how to illuminate my video chat. I will probably order one but it is disappointing to see that this is made in China. I would be willing to pay more for it if it were a USA made product. However, I will still consider a purchase. @Lonna Hi Lonna! We are huge "Made In The USA" guys and the first 3 rounds of pricing came from companies in the USA. Unfortunately, the costs to get it done in the US were more than double the cost to get it done in China. In an effort to keep the retail cost down, we got started manufacturing in China. With that said, we are optimistic that we can bring production back to the US as we are currently in talks with a local company that may be a great option! Awesome. I hope this works out. I would love to have one of these. However, the first products I buy are made in America ones. Good look to you. This is a marvelous product. Hi, what is the color temperature (Kelvin) of the LED? The Kelvin from the Chatlight is about 3800K , I hope this helps! Selfies and video chat lighting often leave us washed out, overexposed, or dark & dreary. Thankfully, pro photographer Henry Geddes came up with an easy fix. Slide Chatlight onto your laptop, tablet, or phone, and you’ll be seen in a flattering light. Whether you’re Skyping with coworkers, FaceTiming with family, or snapping a selfie, your close-ups will be polished and professional. 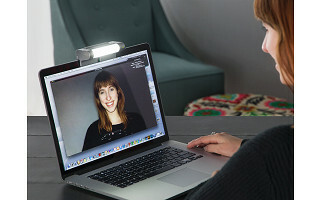 Chatlight shines a soft light on your face, which helps the camera know that you’re the main focus. Even though you can tell the difference between a blank wall and a face, most webcams, phones, and tablets can’t. They expose for the “average” amount of light in the frame, leaving you with weird tints, harsh shadows, or backlighting.